the baby Uggs come out today. the other day while monsieur j and I were doing our walking tour (and photo blitz) of downtown cleveland we encountered a family who had just left the rock hall. maybe I'm just not getting it but I can't quite find the fashion attraction of the young women's choice of footwear. they were all wearing UGGS. jeez, the temperature was quite warm - not broiling but pretty much sandal wearing weather. I do admit later while in the car with monsieur j and e I did go off on a wee rant (it was very wee, hardly a rant) about this sighting. they both looked at me with one of those looks - this one said 'where have you been?' and then in a tone one generally reserves for small children or the extremely aged proceeded to inform me that UGG wearing is quite popular. apparently, aukland to cleveland to paris and back again young women all over the world wear UGGS and it is seen as fashionable. okay, fine but I still don't get it. I even have a pair of UGGS (actually they aren't mine, e left her UGGS at the house when she moved out and she never reclaimed them and you know possession is nine-tenths of the law) they are most comfortable and are great to slip on when I need to run out to the birdfeeder when there's six inches of snow on the ground or when I need to shovel the walkways first thing in the morning before I shower and dress for the day. but it's hardly the footwear I'd choose to clock in the miles of urban walking - guess that explains why a block from the rock hall papa ugg hailed a cab to take him and the baby uggs a mere 5 blocks to their hotel. as a die-hard cleveland promoter I guess I should be thankful for tourists and baby uggs wearing UGGS - I'm sure the cabbie was happy! Who hasn't done Paris and New York? Try a new locale on for size with one of our editors' picks of the top underrated destinations around the world. A working class, world-class "new American city," Cleveland is a model of urban renewal. Once plagued by debt and dirt, the city cleaned up the downtown area and spruced up its parks and waterways to become one of the most livable cities in the U.S. A weekend visit gives you a taste of what makes the city tick. 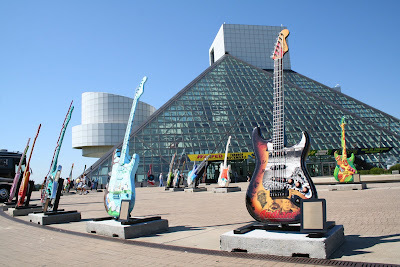 Cleveland's legendary art museum and symphony now have modern complements in the Rock and Roll Hall of Fame and the Great Lakes Science Center. The city's long and proud sports tradition was bolstered by the opening of Jacobs Field, the first of baseball's new classic parks. That blend of tradition and innovation is now Cleveland's hallmark. maybe now my sister-in-law and brother will come up and visit! wouldn't that be loverly!! back to uggs - just a brief digression to plug one of my all time favorite children's books. 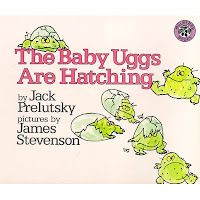 written in 1982 the book The Baby Uggs Are Hatching belongs in the home of every family with kids - actually, it deserves to be in the home of anyone who loves language, wordplay and has a weak spot for nonsense and monsters. james stevenson's illustrations of jack prelutsky's poems is a combination which will bring a smile and warm the heart of the most nimpy numpy numpity! this is probably the children's book which wins the award as my most given kid's book. I've been reading The Social Atom (the book, that is), and it is not surprising that that you find flocks of Uggs. Conformity often outranks sensibility. It's how we poor, hapless humans are, always trying to fit in somewhere somehow. but do uggs wearing UGGS go baaaaa?? I will definitely look out for The Baby Uggs are Hatching, but I categorically refuse to wear Uggs on my feet, and likewise Crocs - I don't care how comfortable they are. I draw the line at Birkenstocks. Why is it that comfortable always looks so Uggly? av - I was just reading a story about how those crocs are dangerous. apparently they are very soft and when wee feet are wearing them and riding on escalators the shoes get caught in the moving steps and the kids toes and feet are getting eaten up!! personally I prefer going barefoot. I do like Cleveland. Though I'm glad it's had renewal and revival, a twisted side of me always wanted to see that burning river documented by Randy Newman. All the same, I always get a good giggle out of those guys in "Down By Law" taking a vacation to Cleveland in January. I'll plan my next visit in May. jt - will have to watch 'down by law' again....well, it's been a while since I've seen it and I'm blanking on the vacation(jarmusch is such a master!) may is quite nice, but there's nothing like watching the surfers on lake erie in january! 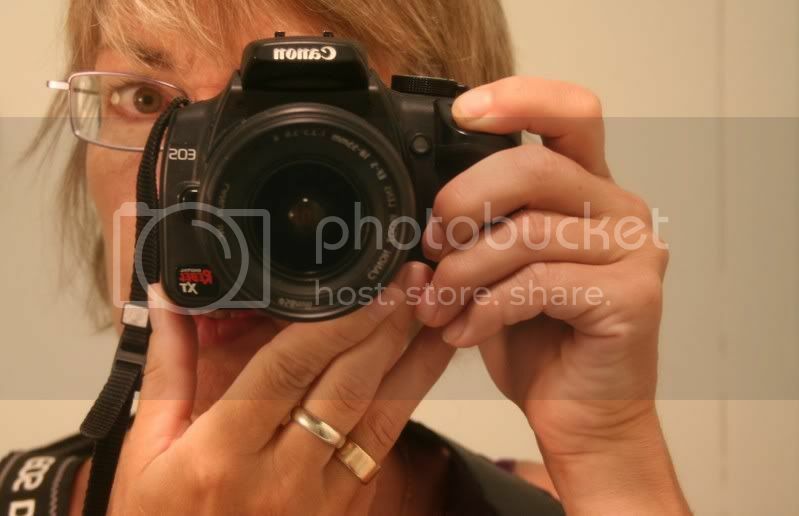 we have lots of great junk shops up here, happy to share a few of my faves. Pretty good narration but uggs? seriously.